Champions are made but prodigies are born and young prodigies are burgeoning around the globe faster than ever before. Now, here’s another Golf prodigy who’s lighting up leaderboards and breaking barriers. 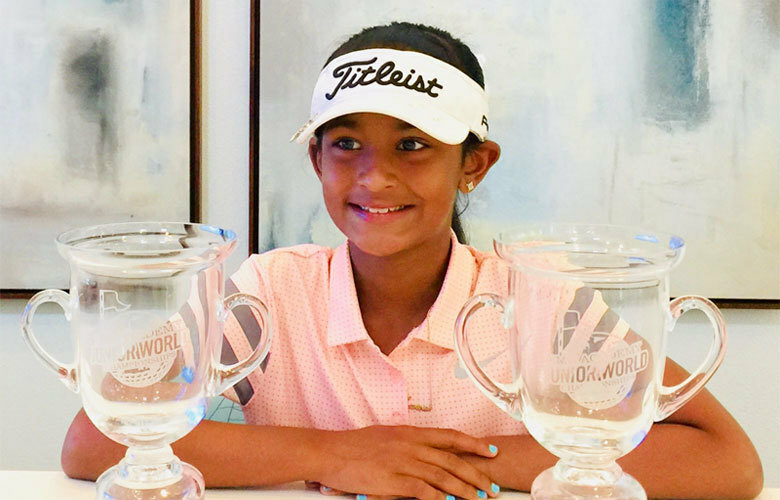 Meet 8-year-old golfer Indian American Golfer Karina Jadhav, who’s currently the No.1 ranked golfer in the USA and No.4 ranked in the world following players from Japan, Thailand and China in the girl's age 8-year category. 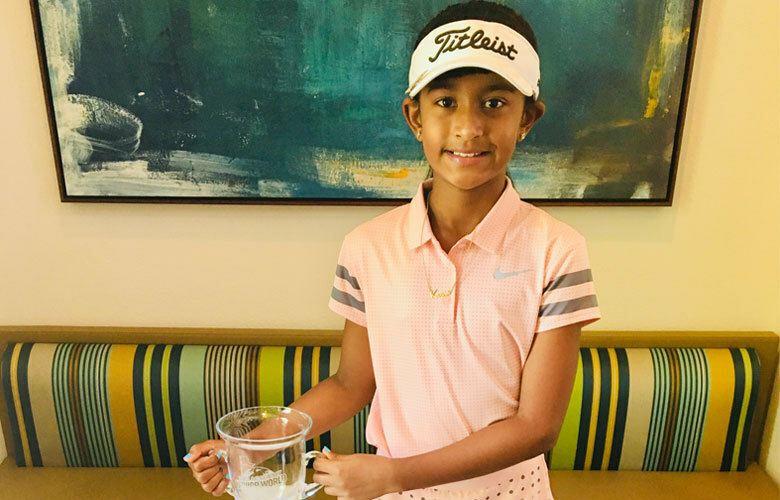 Karina Jadhav won the 2018- IMG Junior World Golf Championships trophy at Sycuan Golf Resort, San Diego in July finishing at fourth place in the 7-8-year-old girl’s category. The IMG Academy Junior World Golf Championships is the largest international event in the world and is unique for its international representation and cultural diversity with over 1200 elite golfers representing 56 countries and 42 US states who qualify from various local and regional qualifiers to play at this highest level. After clinching this trophy, Karina became the No.1 ranked golfer in the USA and No.4 ranked in the world following players from Japan, Thailand and China in the girls' age 8-year category. She had a close finish behind the Chinese player Yujie Liu who finished third in the junior world championship. Karina played challenging rounds of golf for 3 straight days of 54 holes’ stroke play with a total of 182. She won the fourth place in a card-off tie-breaker due to her lowest back nine holes scoring which was possible only due to her incredible perseverance, maturity and mental tenacity in handling the pressure until she dropped the final putt on 18th hole. Also, she shot an impressive even-par total of 57 strokes on moving day and scored the same as the leader Japanese golfer, Mao Nagamine. Karina has won numerous trophies in local/regional junior golf tournaments. Her most prized possession is the IMG Academy Junior World Championship trophy; also inscribed on that trophy are the names of Hall of Famers - Tiger Woods (won 6 times), Phil Mickelson, Ernie Els and Lorena Ochoa (won 5 times). This year marks the second Karina has achieved the junior world trophy (she earned her first in 2016) and is the only Indian-American girl to achieve this trophy amongst all age groups from 6-18-year-olds. In the past, Shubham Jaglan from India has achieved this feat amongst the boys' category. Karina first picked up a golf club when she was only four years old and has developed a smooth golf swing and finesse short game skills. She is going to Third grade at Pegasus private school located in Huntington Beach, CA and practices every day at various golf courses in Orange County. Her favourite part of the golf game is driving, she can drive the ball to more than 160 yards at this young age. She also won a medal for driving distance in the 'Drive Chip and Putt' local qualifier competing in the 9-year-old girls' category held at Arroyo Trabuco golf course. 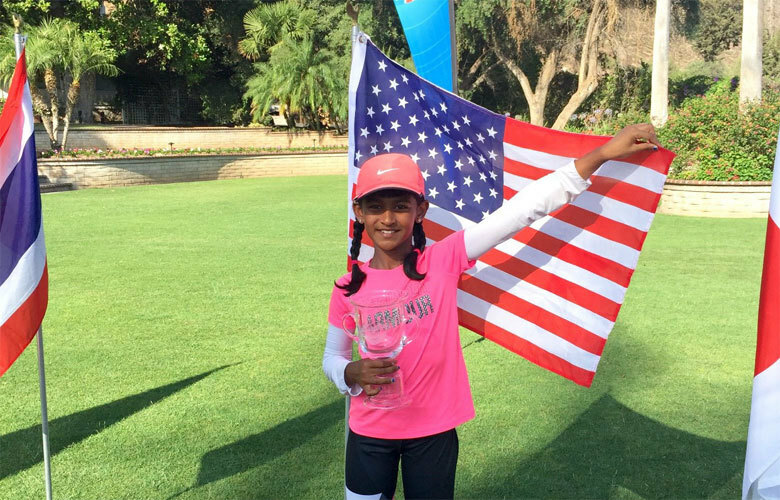 Karina is very “passionate” about playing golf and wants to play on the LPGA Tour and become the youngest Indian American winner on the tour and to reach there she knows it takes hard work, dedication and determination, there is absolutely no shorts cuts!